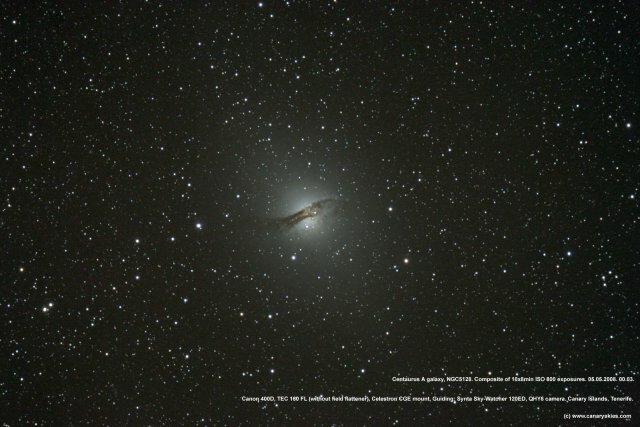 Canaryskies.com Photo Gallery by Max Anderson - Top rated/Centaurus A galaxy, NGC5128. Composite of 10x8min ISO 800 exposures. 05.05.2008. 00.03. Centaurus A galaxy, NGC5128. Composite of 10x8min ISO 800 exposures. 05.05.2008. 00.03. Canon 400D, TEC 160 FL (without field flattener), Celestron CGE mount, Guiding: Synta Sky-Watcher 120ED, QHY6 camera. Canary Islands, Tenerife.